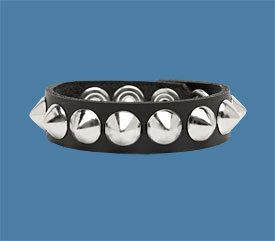 Add a little kick to your look with our new cone wristband! 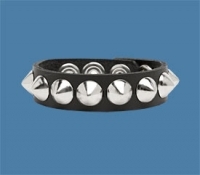 This black wristband features one row of 1/2" chrome cone studs on an ALL leather bracelet. Handmade locally just for us - not a mallstore cheapo! The snap closures adjust to fit wrists from 5 1/2" to 7 1/2" around.